Flying cars are the stuff dreams are made of – or are they? While the M200G Volantor doesn’t exactly take to the skies in a dramatic fashion, it does float around for a start. 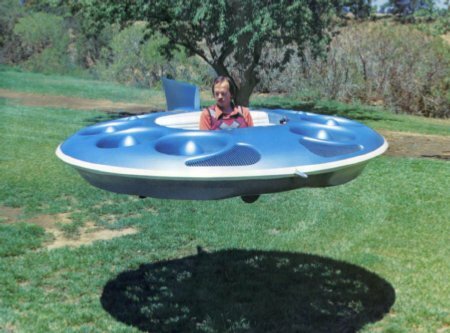 Moller International has already begun production on this two-seater floating vehicle, hovering up to 10 feet across most surfaces at a top speed of 50 mph. It costs $90,000 a pop, but I wonder where you’re going to park this thing. Looks like traffic officers can’t exactly fine the M200G Volantor for speeding in a 30 mph zone as they can’t exactly catch up with it. The preferred fuel of choice would be ethanol, and it is interesting to note that this machine meets the Ultra Low Emission Vehicle standard without the need for exhaust after-treatment. The age of the Jetsons are upon us! This is clearly another (of many) cases where someone posts a gag-article and coolest-gadgets thinks it’s real. No joke- This is a way to sell the technology while the “Skycar” avionics is being perfected. As a stockholder in Moller, I can assure you this is on the level. You’ve gotta be kidding me! There’s a 100 foot crane in the background and a line attached to this gadget. As Bugs Bunny woulda said: “What a bunch a maroons!”.